We missed karate all week. I had to get Kendall on Monday, then snow Wed and Thur, and I snowboarded Tue, so I haven't had a workout since last Thur. Delaney and I went down there, but didn't realize they'd combined the 11 and 12 classes because of the holiday. So we arrived at the end of the class. Oh well, we went and ran errands instead. Still no Brown Belt test, but I'll do it when I get back from Vegas in 2 weeks. Each year I host an opening night party at the PASS Summit. I set up a deal years ago with the PASS organization to refer people to the event. In exchange for referring people, and having them use my code, my company got $50 per person as a fee. We decided early on to spend the money on a party for the people that used the code, and our famous opening night party was born. And it's the best day of my year at SQLServerCentral. I get to give away a polo shirt and a book to everyone that comes. We print up the Best of SQLServerCentral each year, a collection of the best articles from as many authors as we can and give it away. I've also had polo shirts embroidered every year with the SQLServerCentral logo, choosing new colors each year. Every person using our code, or buying a ticket, gets those gifts. I also budget out the event based on the number of attendees. After removing the costs for the books, shirts, and catering, I go out and blow the rest. I go to Best Buy, Wal-Mart, and look to just blow over $1,000 on whatever I can think of. My goal is to get something for every 2 or 3 people and randomly give most of the gifts away. I have a good time at Best Buy, thinking of gifts that people might enjoy. However it pales in comparison to the fun I have giving away the gifts on opening night at the PASS Summit. When we started the agreement, it was through my partner, and he wanted to promote us a little, so he had some oxford shirts embroidered and we gave them away to the people that used our code. The first year we did it, we gave away shirts, and it was a zoo. We were a part of the opening reception and a line went across the room. People got in line, not knowing why. It was crazy, and a mess, but great fun. So the second year we made better plans. We talked with the PASS board and managed to organize our event to follow the opening reception in our own room. We budgeted things out, and found about $4,000 worth of money left. After brainstorming, we thought about an XBOX event. The Summit was in Florida that year, so we arrived a day early and went shopping. We'd inquired about renting TVs from the AV vendors, but they wanted $300 for a 2 hour event for 32" TVs. That seemed silly to us, so Brian, Andy, and I drove to Circuit City and bought 6 32" TVs and 6 XBOX consoles. We set up the consoles with the TVs in a room, and had people come in and play. We also gave people stickers with numbers. Our thought was that we'd have people find their matching number, and we'd have 3 pairs of winners. When Brian asked people to find their matches, we had people running around yelling their numbers. Not exactly networking. When Brian said the first pair to come to him, we had people falling over chairs and running. It was a mess, so we gave that first pair away and then randomly gave away the other consoles. At the end of the night, we gave 3 TVs to local people we knew from Florida, and 3 more to hotel employees. People loved the TVs, and we decided to try something new. Our third year, I was in charge and searched around for various party themes. I decided on a casino party, and contacted Aaron's in Dallas. The event was in Grapevine, and Aaron had a great price for catering. So I booked them, arrived a day early with 40 DVDs, and then went shopping with Andy and Brian. We loaded up a cart full of stuff from Circuit City, spending about $1500 on all kinds of gifts and then randomly gave them away at the party. That was such a huge hit that I've repeated that formula for the last 4 years. I've booked a casino company, West Coast Entertainment in Seattle, and then spent every penny left over on prizes. A couple years ago I actually went over budget slightly, I was having so much fun buying stuff. This year things are down. We have less people attending the conference and less referrals. However I started selling tickets last year for speakers and other people that can't use the code. To handle that, I've purchased only a few dozen shirts and am taking leftover stock from previous years. So instead of a new color, we have colors from previous years. We've printed less books, and if we run out, I'll have to ship some out. The casino company cost more this year, but I've managed to scrape 65 presents out of my budget. We have a lot of DVDs and books (40 of them) and then lots of other things. Since I won't have time to shop in Seattle, I've had to limit what I buy so I can pack it in my luggage. So no Wii, no XBOX, but I have added in some gift cards of various amounts ($25, $25, $100) that we'll give away as well. I'm thinking I might print out some numbers, and stick them to people's books. And then randomly call out some during the event. I have a day to set something up, so we'll see what makes sense. Show up and see what I come up with. At least for now. It's back to the routine with the snow melting and us able to get out of the house. We went out last night, and today we're back to the horse training for Tia, karate for the Ds and then trick or treating for the little kids tonight at a friend's house. For now I'm working, and trying to get a few things done before I leave for Seattle Monday morning. Lots of packing and a few last minute things from the store. I was feeling done with work around 5:30-6 last night. I needed to write, but the kids were antsy, and I didn’t think it would be productive. So I went across the family room. Kendall was watching some cartoon, Delaney on the iMac, absorbing YouTube directly to his brain. I fired up the XBOX 360, and put in Rock Band. Grabbing a guitar, I proceeded to run through a few songs, stretching my skills on the game. I kind of felt like I should be on the real guitar, learning something, but this was a release. It was a time to have fun. Kendall wandered over after a few songs and grabbed the mic to sing. The Tia came over to sing, and I eventually gave Delaney the guitar. We had a good time for awhile, getting everyone involved. Then Kendall asked if we’d play Scene-It. We have the Disney version, and didn’t want to go through the whole game thing, but we put the DVD on and sat around, all of us trying to guess the answers. That was fun for another hour. It was getting late, and Kendall went to get clean, and Delaney brought me poker chips. He’d asked me to play yesterday, and I’d played a game of Life, and one of chess, but I had to work. So finally around 9 we broke out some chips, and played some blackjack. Tia joined in briefly, but then it was just Delaney and I. I played the house, tried to give him some ideas on basic strategy, and let him play. He realized that he loses more than he wins, but by thinking a little and using basic strategy, he can play for awhile. He still loses, which he doesn’t like, but he also starts to see it as entertainment. And that’s how I’ve framed it. It’s entertainment, like buying a lift ticket and spending the day doing something. You can sit there and play for awhile, but you’re going to pay for the privilege. It’s not likely you’ll win. I don’t like gambling and it’s not for me, but I want to make sure if the kids show interest that they realize the dangers of it. They can have some fun, but don’t go in there expecting to win. It’s finally visible, after 2 days of snowy, blowy weather. I woke up, and could see the first rays of the sun coming up. I walked to the window and could see blue sky. It’s nice to see the sun. It’s the reason we live here. It shines the vast majority of the year. Two days of cloudy weather, almost three with Tuesday afternoon, are rare. Now we need to dig out at some point. There are drifts behind the truck that are up to the tailgate, and I’m sure bigger ones down the driveway, and maybe on the road. I'd go start this morning, but I’m not sure how long it will take, nor now much diesel I have. I should have filled up on diesel and propane last week and didn’t. Not me, but Tia and the little kids went out tonight to feed horses. I haven't been outside in 2 days, and I'm OK with that. It's still blowing a bit and it's cold. I'll run out tomorrow and clear out some of our driveway. I heard the neighbors got stuck in the roads around here and hiked back. Not the day to be wandering around. I shouldn't say definitely. It's been snowing all day, and blowing. Tia said last night she had drifts to her knees, and today said there were some up mid-thigh when she went to feed. I haven't bothered to go out, since it's cold, windy, and there's no reason to. I guess we could get out with the tractor and the truck if we had to, but we don't need to. So no reason to do anything. Conferences canceled today, which isn't great. I wanted to talk with Kendall's teacher and see what she needs to work on. The little kids don't care, other than being a little bored here at home, stuck inside. We're not even trying to get to the neighbor's house in this weather. Mostly because no parents want to make the walk. Kyle decided he wanted to go to a friend's yesterday. Tia would't let him drive, but they came into the road and he hiked out to meet them. He called today, wanting to come home, but we said he'd have to find his own way back. We're not going out to try today. It's funny. I have friends all over the world, many of them heading to Seattle for a conference next week. I'm going as well, but none of them are snowed in. In fact, some of them are having late summer weather, and it's kind of funny to have so many of the people I work with and talk to regularly not experiencing the same thing. It's much different than when I was in an office. We all had fairly shared experiences based on proximity. Something that's not the same on the Internet. I took off for a half day today, the first day of snowboarding for 2009/2010. I've been wanting to go for a little over a week, but none of the days have really worked. With snow expected tonight, I thought this might be a good day to do it. As you can see the car was a mess, but I didn't need much. Coat, gloves, backpack, boots, board, and that was it. I headed out, stopping to grab gas and a little food on the way. It was about 60 minutes from my house to I-70 and C-470, just heading into the mountains, and about another 45 to get into the mountains to the Eisenhower tunnel. Not much traffic, roads were clear, and it was actually a nice day when I got up there. About 32F, but not too windy. I grabbed a ticket, and changed, and then headed up. As usual with this time of year, I didn't wait at all for lifts, maybe one person in front of me. There were relatively few people out there, but enough that it didn't feel lonely. I ended up going up and down quite a few times, listening to the iPod, and just cruising around. I had one good fall coming down early on. The new board turns a lot quicker, and easier, than my old one. After only one green, I headed into the blues and promptly hit some ice, went to correct, and over-corrected, landing on my back and rolling. It was a hard hit, and I'm glad I had a helmet on. I went for a couple hours before stopping for lunch. Some quick chili and then back out for another hour. At this point it started to get colder, windier, and the storm was coming in from the West. I had things to do, not the least of which was a little more work, so I headed home, taking it easy with a nice ride back before traffic hit. Oct 27, and that might be my only Oct ski this year. With a storm the rest of the week, I'm not sure if we'll get back up here. I think karate will be cancelled tonight because of the snow, along with tutoring and that’s fine. As much as I was looking forward to a brown belt test, I’m a little sore today. I had one good fall yesterday, and used a lot of muscles I haven’t used in some time, and the body is aching all over. I want a snow day too! I'd just cracked an egg and was beating it. The hash browns were in the pan cooking and the phone rang. Delaney was coming downstairs so I told him to go back to bed. There isn't much snow, and the school websites had nothing on them, but the bus driver called and said they'd decided to cancel school. I'm not surprised. They just plowed the roads, the next two days are fall break for the little ones, and it's a decent amount of money they can save by calling it a week. Not to mention goodwill for the teachers and kids. Kyle's off as well. With snow coming in, I'm sure Douglas County wants to save money as well. We'll see what happens since they had fall break last week. I wonder if he'll have school tomorrow or Thur. For a half day at least. I woke up, debating whether or not to go skiing. I haven't been this year, and though it's early, I want to go. Things have come up, and this seems like a good day. Especially as I'm gone for almost two weeks starting Monday, so I won't get many chances. The little kids are off Friday, and we've talked about going, but it's also supposed to snow the next two days. Which means the roads might be bad and it might not be a good idea to head to the mountains. So if I don't go today, then I might not be able to go for awhile. OK, I'm exaggerating. We could go this weekend as well. But I'm in good shape for work. Things are scheduled, I have editorials ready to go, and I got my guest editorial for Friday, so I only have to upload one tonight and then I'm good until next week. I'll have a few ready, but I'm thinking to shoot some live while I'm there. So it's a good day to go skiing. Delaney was feeling tired and a little sick after school, so I just sent him to bed. Tonight's shuttle bus was just Kendall and I, heading to tutoring and piano. While she was busy, I went to Best Buy for some shopping to get ready for my party next week at the PASS Summit. I also did a little work on the laptop, trying to get a podcast done for Wed so I can go skiing tomorrow. Not sure I'll go, but if the weather in the mountains is OK, I'm thinking to open the ski season tomorrow. 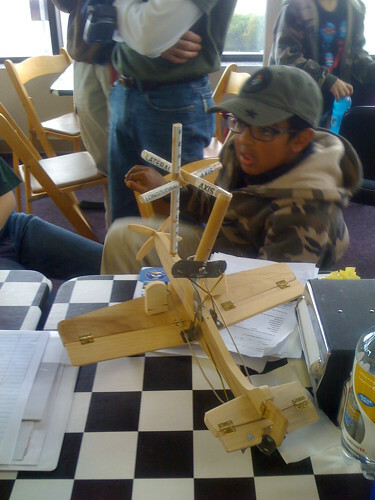 Delaney had the chance to work on his aviation merit badge this weekend with the Scouts. It's a part of the Young Eagles program, and it was pretty cool. He had ground school Friday night at a local fire station, where 20+ kids from our troop and some of the Cub Scout packs went down there for 2 hours or so of learning about planes and flying. Then it was up early to head to a small airport in Denver in Saturday morning. We arrived early, everyone tired, but Delaney excited. He sat there and was talked with other Scouts and checking out the model below. Kendall was less excited. She played her DS a little, and then said it was "boring" and wanted to learn. 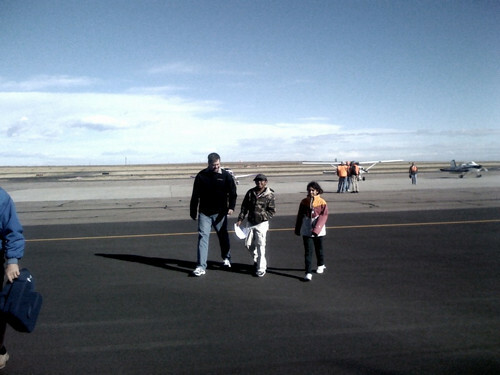 Unfortunately Delaney was one of the last kids to fly, so she had to wait around. While they were waiting, Delaney had a review of how planes fly from our Scoutmaster, who's a pilot for one of the airlines. He had some great explanations and really caught the attention of the kids. Kendall had the opportunity to do this program, but she didn't want to, and I wasn't sure she'd sit through ground school or fly alone. Even that morning she wasn't thrilled, but finally as the morning wore on she said she would fly with Delaney. There were 2 seat and 4 seat planes, so I was hoping we'd get a four seater. I asked the guy in charge, and he said he'd see. Finally we got called and walked out to the tarmac. 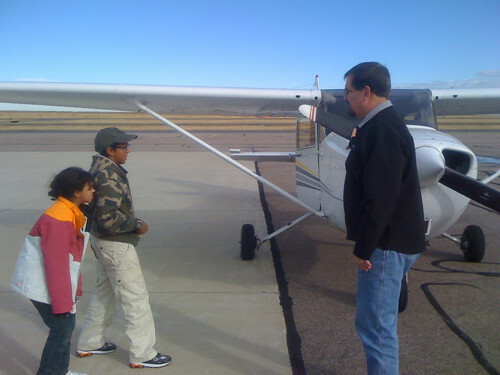 We had a 4 seater and the kids went through the pre-flight instruction with the pilot, learning what to check. Then they were strapped in: Delaney as co-pilot and Kendall as passenger in the rear. They took off without me.I had no interest in flying, especially in a small plane. So I waited while they had their 15-20 minute flight. Finally they were back, and smiling. They both had a good time. Kendall said she was scared and exited, but she enjoyed it. Delaney thought it was great, and he'd like to do it again. I wouldn't mind getting him involved in Young Eagles, but it will have to wait until we're less busy. They only get to co-pilot once, but next year Kendall can do the ground school and fly again. She said she'd like to and Tia said she'd go up with her if she does. Delaney liked piloting. He didn't do much, but said it was neat to feel the controls respond to the wind as they flew. I also learned that our Scoutmaster just learned to fly as a student and took classes. He was never in the military and has an airline job. So maybe this is something Delaney could do at some point. We're heading to St. Marteen in January. Tia was rewarded with a free trip for 2 to St. Marteen in January as a part of her sales organization. The top performers win a trip every year to some destination. While she's worked there she's seen people get trips to Hawaii and Canada, and always wanted to go. She called me Thur or Fri night to let me know that she'd won the trip and we were heading out for 5 days in the middle of Jan.
Every spring when it starts getting warm, I pull the doors off the tractor. The heat builds in there from the sun with plastic windows, so sometime around May it's uncomfortable to be in there. In the fall, the reverse happens. It starts to get cold, and I don't want to be out there plowing, especially in the wind, without cover. The tractor's been stuck up at the front of the yard since I pulled out the Prius. I haven't been wanting to take the time to walk up there and get it. But with snow forecasted for overnight, I might have to get out there tomorrow or Monday. So I decided to walk up this afternoon. Kendall joined me for the "long" (1/4 mile) walk up to the gate. We fired up the tractor and then headed back. She rode on my lap, and I let her steer it around the jumps in the yard. There's a lot of room for error, but she seemed to enjoy it. At least until we get close to the house. Then she wanted me to drive. I pulled up by the shed, and she worked the lift controls while I attached the rear blade. Then we pulled the doors out of the shed and while I held them up, so tightened the nuts on the bolts. They're not tight, but we're prepared for winter. Or at least snow. I wanted to head up to Loveland today. It would have been a good day to go up there and get the season started. New board, likely not crowded, and it was supposed to be sunny. However I woke up with a sore body. After karate last night, and I’ve missed a few classes this week, my body felt beat up. It felt like I’d gone 3 rounds with someone and taken a lot of shots. Sore back, arms, legs, just felt tired. Then I thought about trying to race back, run this afternoon, and then take kids out tonight for Delaney’s ground school. I figured I’d run myself into the ground, so I decided not to. Plus I found out I’d forgotten something for work, and I’ll need to spend a few hours on that here soon. So now snowboarding today. Maybe Sunday. Both kids were easy to deal with this morning, and it made things nice for all of us. First, I didn't wake up early. Between being tired and trying the iPod alarm, I woke up at 6:20. I could see Delaney's light on, and he walked out a moment later, coming to shake me on the shoulders, telling me I was late. Yesterday Kendall was tough. She was tired, then didn't want the socks I got, pulling them off. Not wanting the shirt, so I asked her to get dressed. I went to get contacts on, and came back 10 minutes later to find her sitting in her room doing nothing. This continued a few times, with her saying she didn't have socks, couldn't find pants, basically not wanting to do anything herself. Tia had a hard time with her on Monday as well, and we ended up fighting until she went to school. Both of us were upset. When I picked her up, we sat down and talked a little. I let her tell me what she didn't like and I told her what I thought was the problem. We both agreed to try harder to understand the other's point of view. So when we got back from karate, I suggested that she find clothes at night so there wouldn't be a problem in the morning. She agreed, and made a pile at the end of her bed. This morning I got her up and went to check email. She came downstairs quickly, dressed, and happy. She said that worked well, and then asked if I would take her out for breakfast. She was so pleasant, I agreed, and she got a custom cooked Subway breakfast before school. Someone posted a note on Twitter about the Sidekick fiasco. Apparently the servers that lost data weren't Microsoft servers. They were actually Oracle, Sun, and Linux servers that were at a Verizon data center. Microsoft bought Danger last year, and when they had issues, they spent time and resources to recover the data. And T-mobile, and possibly Microsoft, is giving customers some credit for the hassles. I had a Sidekick for awhile, and my son has one as well. I thought it was a great device when I had it, with an easy to use keyboard, and some nice features. I'm not sure how they've changed since the Sidekick III, but now that I've had an Android phone, and an iPhone, I think it's way behind the features in those devices. I suppose some people will spin this as Microsoft not necessarily having the expertise to run these servers, but that's silly. Microsoft bought Danger, who presumably had the talent to administer these. They were at the data center they've been hosted at for some time, which also likely has talent there to help out. What was amazing is that Microsoft didn't try to spin the PR on this and say this was an Oracle or Sun issue. They left it alone, letting plenty of people blame MS software and use this as an example of why Microsoft software is poorly written. This report says that Microsoft may have been attempting to move the service, and that's certainly possible. Maybe they were to blame and didn't want to raise that issue. I don't know that a root cause will ever be reached, but I can definitely see T-Mobile moving the Sidekick brand to an Android phone. It's a better OS, it saves them $$, and they consolidate some of their own support. I love pizza. I think it’s easily my favorite food, and am rarely no in the mood. Frustration at work, with my editorial and blog and the responses today, not to mention the debates and arguments on Twitter. With Tia gone, it’s too quiet, and I needed a little comfort. not to mention milk for the kids. So I headed to Parker for lunch, grabbing a pizza at a local place. I had my netbook, working as I went, but it was nice to get out and relax. Now waiting on the carpet cleaners and digesting before my run. 5:00 – wake up, check the clock, internal groan. 5:30 – tossing and turning, check clock again, drink water. consider getting up and decide to try to rest. 5:45 – alarm doesn’t go off. Check iPod, it’s set for 5:52. grumble, get up. 5:52 – pull on boots, head outside. Start tractor, walk to the ATV to look for chains. Can’t get the chain loose, head back to the garage. 6:00 – find chains, get in tractor, headlights on, start down the driveway. Plow one side. I get one side of the driveway plowed, and it looks OK. Not as much as I’d like, but it’s hard to see in the dark. Really need lights up higher on the tractor to shine beyond the blade. Wish I had doors on the tractor, but there isn’t too much wind. I get to the Prius and pop out the front hole for towing. Then I head to the rear hatch and I’m looking for the eye bolt. There’s no light there, I wish I’d brought a flashlight, but I find it by touch. I also start the Prius up to warm up and put in in neutral. Screw it in front, back up the tractor, use the clasp to hold the chain together and get back in the tractor. I feel a pull and then a snap. The clasp didn’t hold. After a minute of cursing, I get down, go back and check another link I have. I screw it on the chain, and cross my fingers that it will hold. I go slow, and move the car out. I pull it up to a relatively level spot so it won’t get stuck. I then pull the Prius close to get slack, remove the chain and eyebolt, and then move the tractor. I flip the Prius around in the cul-de-sac and then head to the house. It’s 6:45, and I’m hoping Delaney is up. He isn’t, but I get him up and we manage to make the bus. It helps the bus is almost 10 minutes late. Go back, get Kendall up. She’s more trouble and moving slow, but we manage to get to school just as the lady stopping traffic starts to go inside. Kendall reaches her at the door, so she’s not too late. Back home, the Prius is really slipping. I get garbage out, but almost get stuck a few times. Park the Prius in the cul-de-sac, fire up the tractor, plow the road and driveway. Hopefully no more Prius adventures today. I was debating whether we should head out tonight, but the roads didn't seem that bad when I picked up kids from school, and I wanted to get milk and a couple grocery items. The kids had gone outside after school to sled a little after homework, and we packed up to leave. As we headed down the driveway, things were fine. As we headed up the other side, the Prius bogged down a little, which I expected, but then it slipped off the left side of the road. There's a bit of a ditch there, not deep, but deep enough that the tires slipped in and the @$! @#traction control killed power to the right wheel. So we were stuck. I tried rocking it, and managed to get down the driveway a bit, but it couldn't get power to get up and we ended up sliding to the right, this time getting stuck. So I guess things weren't to be. We had to hike back, Kendall and I making it back easily, Delaney had to get his boots on and then ran back, so he had a little workout. I debated getting the tractor out and pushing the Prius, but it's a mess now and it's supposed to clear up, so I think I'll aim to try in the morning. Get up early and go out there before Delaney needs to leave. The weather in CO is something else. They were calling for snow last night, but nothing had really come down when we got home at 9 from scouts. However we woke up to a white ground and snow coming down. When I left the garage with Delaney, it was still coming down and the Prius slipped around a little. We were heading up the road when Delaney struggled getting boots on. I stopped since I thought we might need to go back and get shoes and then struggled to get the car moving. It was slightly better when I took Kendall, a few cars having run down the road, but still not great. If it doesn't stop soon, I'm not sure we're going to get to tutoring and karate tonight. Tia took the truck to the airport for her Las Vegas trip, so it's the Prius or Porsche for transportation. Tia was running late, so I got stuck handling the horses this morning. Not a big deal, and thankfully it wasn't too windy. I got finished coffee and then grabbed boots, a coat, and the first hat I found to cover my head. Maybe not the best look, but it worked OK. Maybe not the best look, but cold in CO isn't that cold. They had some fun in the snow while I got 2 bales in the cart and wheeled it around to various places in the snow. Actually I got a bale in the cart, hunted around for awhile looking for scissors, finally found a different pair then I expected, and then cut the bale loose. Gemini's in jail for some reason, probably a second degree account of herd bullying, so he gets fed by himself. The it was out the back door, where the wind was just blowing a little snow around. The horses sometimes don't want to let each other eat, so I have to spread things around. It's not too bad, and I used the buckets we had, but to be sure everyone could eat on this cold morning I had to drop a little on the ground as well. They didn't seem to mind and each picked a pile to start eating from and ignored me. I finished and was going to walk away when I thought I should check water. It wasn't that cold, but there was a layer of ice in one bucket, so I plugged in the heater and got that set up to be sure there will be water for the herd. And I forgot Gemini. Just realized that, so I'll be heading out shortly to see if his water is frozen. Delaney had his second Court of Honor at Scouts tonight and received his Tenderfoot rank. It's really the first step to Eagle and he seemed proud. I walked up there with him to get it and got a nice hug. I'd forgotten the red ribbon for the pin, but I'll need to remember it next time. There were 3 boys that were recognized since the July Court, and that was pretty cool. One came over to talk to another leader near me, and stopped to introduce himself to me and another Dad. That was pretty cool. He was a nice young man, great manners, and impressive. I'm hoping Delaney will be like that when he gets to that point. There's going to be another Court of Honor in December, and I'm going to remind him he can move on to another rank by then with some work. He's close to 2nd class, just 3 or 4 requirements left. He's also close to a few more merit badges. 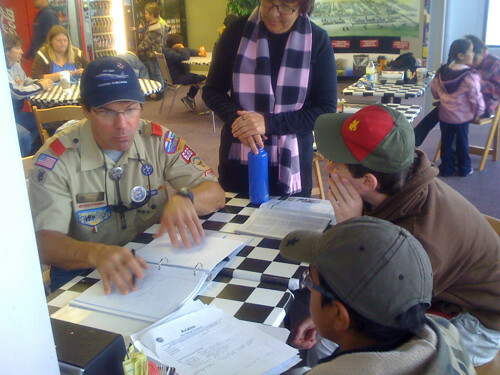 Space Exploration just needs a signature, Citizenship in the Community a couple things, and then he will earn Aviation this weekend at a Young Eagle event, and Metalworking at the merit badge college in November. He felt a little bad that he didn't have 2nd class done. He's been close for a couple months and has slacked off, but we've been busy, so I haven't worried or reminded him much. I told him to not worry about it. He's on a good pace, and should have 3 or 4 more badges by December and I'm sure he'll have 2nd class by March. That's a pretty good pace. A year in and he will have 2 ranks and 6 or 7 merit badges. The temperature has been dropping all day, and a haze moving in. It's supposed to snow tonight, and a couple days of cold weather before it warms back up, but it looks like winter is finally moving in. I haven't put the doors on the tractor yet, so I'm hoping it doesn't accumulate. Not a big deal, and I had a nice 2 mile run yesterday outside. So my plan was to hit karate this morning, and run before class. I usually go about 15-20 minutes early, run about 1.3 mi around the block, and then do class. Kendall wanted a snack, so I ran by her school and that made me late for my run. I had about 8 minutes, which would have been a stretch, especially with Shihan McGloughlin teaching. He tends to start on time. So I did class, working a little harder than I expected with one of the older kids in class. I actually popped the pad a little hard one time and it smacked him in the mouth. A little bleeding, but he was tough and didn’t let him slow it down. It was good class. When it finished, I was tired, but wanted to get my run in. So I started around the block. It was hard, and I was struggling as I headed down the sidewalk. It felt like some of my runs after snowboarding last year. However I struggled through it, getting done and feeling like I accomplished something today. But now I’m beat. Ready to go lay in bed and work. I have a friend, he’s a technology guy and fairly savvy with hardware and software. We were talking recently and he said that he didn’t see the point in performing backups or even buying software for his machine anymore. He runs Windows and *Nix in various places, but uses GMail for messaging, Google Apps and Docs to store things, Picassa and Flickr to store photos, and Yahoo’s Calendar service (he’s been with them for years) to manage things. He syncs to his phone, and I think he’s even trying out Google Voice as the phone number management issue. When they start offering hosted servers or VMs, he’ll be looking to host there as well. I questioned him about backups and he said that Google just does a better job than he could do. They have redundant everything and they have more knowledge about how to better store things. He trusts Google to do the job for the foreseeable future. I’m not sure I’m quite there. I have lots of stuff stored at Google: various blogs, my calendar, my contacts, I use google Voice, etc. I have pictures up on various places, and I do think that having the cloud store my data makes sense. It allows me to sync things across multiple machines, as well as my phone. But I don’t completely trust Google. There have been issues with GMail, and recently with the Sidekick servers at Microsoft. I still think I need to keep copies of things on my machines, and as backups. I’ll just say the various cloud services, especially Live Mesh, make it easy for me to keep multiple copies, giving me an instant backup in multiple places. I booked a massage today at Massage Envy. Both Tia and I signed up for the yearly plan last year. We save $10 an hour for massages and we are billed for 1 a month, but can do more. We've both fallen behind, especially over the summer. I wasn't sure how much I'd like it, but I did early in the year. Especially as baseball started, going there on Mondays helped me feel better and relax. It's good to get a nice rubdown, but it's also nice to just lay there and relax for 50 min. I think just that stopping the day and relaxing is sometimes the most valuable part. I went once at the beginning of the summer and got a hard massage that actually jacked up my back for a few days. After that I was wary, and have gone to using female therapists a little more since they tend not to push the muscles as hard. I like hard rubs on my legs, but once in awhile the men go hard on my neck, even though I've warned them, and then I'm jacked. Today was a nice, relaxing, medium pressure one, and I felt more relaxed. Even my neck feels a little better after the session. I'm not sure, but I think I even dozed off for a few minutes. A sore body today. Between an uncomfortable seat on Saturday night, and working around the house, the body feels a little beat up today. No karate tonight, but I'll run and I booked a massage for lunch. In a recent talk I gave, I recommended using images to spice up your blog. I think it's great, and I often include images in my posts where I can. I typically grab screen shots, or use pictures I have, but I have linked from the Internet. However someone asked me about copyright. My reply was that linking an image from another site should protect you from that. There was a case that went to through the courts that held a link, meaning a hot link (using the "img src=" tag), wasn't a copyright violation. But copying the file to your service and using it, was a violation. However a few other people posted links to complaints people had made about hot linking, saying it was "bandwidth slurping or stealing." If there's a copyright notice, like on a photo or cartoon, don't use the image. If someone complains, take down the image or link. If it's a large site, like Amazon, use a link, but give credit to them. Amazon actually allows you to save their images off to your server. If it's a small site, ask them. That's probably the best solution. I think that I'll give credit on future photographs that I use in my writings and copy them to my server. A sore neck today. I think it was all the painting work I did yesterday in the trailer. Tia had cleaned it out, pulled out the mats and scrubbed the floor. It started to get late, and so I went out to paint the floor and be sure if got done. It's supposed to be a once a year event, to paint the floorboards. So I opened the paint, gave it a quick sweep, and stared painting the floor. I knew it was hard work, so I brought a rolling stool in there and sat on that, but it was still constant bending over to get paint and reach for the next spot to cover. It didn't take long, probably 45 minutes, but I knew that my back was a little sore by the end. However after sitting last night in the roast and then sleeping, my back was definitely tight and achy. I woke up this morning, feeling it tight, and as soon as I sat up, my neck felt a pull. It's different this time, pain when I bend my neck forward as opposed to turning it side to side. Something tightened up and pulled on a nerve. Now it's time to take it easy today, running a couple errands to fix toilets and then watching football. I broke one of my favorite coffee mugs this morning. I'd taken it in the bathroom to finish off a half cup with my morning business and set it on the half wall near me and when I stood up, my elbow bumped something. In slow motion, the sound registering in my ear as I saw a black blur fall to the floor. I had a momentary vision of it landing safely on the tile, but no luck. It shattered, spilling the last few ounces on the floor. "Dad, what have we learned?" I stopped and looked at him, and he told me "Don't drink coffee in the bathroom." I've got a conference to attend in a few weeks, and needed to get some things out the door. Every year we give away a lot of shirts and prizes at a party, and typically I have the person I order shirts from send them to the conference. However this year I wanted to re-use a bunch of shirts. And I still have about 10-12 XLs and 3 Ss sitting in the basement. With about 4 dozen S, XXL, and XXXL shipping from the supplier, I think I'll be shipping shirts back home again, but at least I won't have a big inventory for next year. There is an amazing debate occurring on Brent Ozar's blog where he interviewed Matt Morollo. Being a little out of touch this week, it's incredible to me there is so much passion about the election, but not so much on most other issues. Even the East Coast v West Coast location doesn't generate this many comments, though maybe that's because we don't vote on it? On one hand I feel somewhat hypocritical weighing in on this topic because I'm not running for the Board of Directors. I feel guilty for not doing so, but it's not my time. Maybe in a year or two, but no promises. But it has alternately annoyed, irritated, and concerned me, so I needed to weigh in. I'll post this comments in the debate, but here's what I see. Matt isn't a DBA, he has a different perspective, and he brings a fresh look at things to PASS. He actually reminds me of a past board member that viewed the world in a different way. I'm not sure if that's good or bad, because, as Brian Kelley pointed out, a fresh view can help, or cripple a board. I agree with Andrew Kelley that we don't need to just elect SQL professionals, and in fact, I'd like to see one non-SQL person on the board to stimulate debate. In fact, on many corporate, and other boards, the people are not necessarily engaged in that business. They might have a tie, but they work in other areas, typically non-competitive. That being said, I worry about Matt's personality. I have not met him, but the responses I have seen to the interview concern me. A number of them seem to be taken as personal attacks, and the responses seem to shift arguments. I can't tell if Matt's answers in the interview and comments that mention his company are going to be a problem, or a conflict. They're part of his experience, and they might be analogies to make a point. Or they might be plugs to push in the future. I can't tell, but they raise a (small) flag for me. Did I vote for Matt? I can't say as I don't want to influence people. I'll disclose my votes after the results are in. This is probably worth a separate post, but here's what I've seen over the years with PASS. The board has to work and manage. PASS is relatively poor. They seem to have struggled to survive at times, by their own admission, and board members have had to manage projects, and even participate (note Rick Heiges' participation and work recently on 24 hours of PASS), at times. This isn't a board that meets a couple times of year, talks about direction, and then lets management do all the work. I like the direction of the current management company, and the group seems to get things done, but the board has to work as well. Otherwise where is that 5-10 hours of work I week I've seen bandied around during the "should I run" process? Board members have to manage projects, manage areas of work in PASS (marketing, finance, content, speakers, etc.). In my mind we need a variety of companies (no more than 2 from any entity), experiences, and backgrounds. I like the idea of someone from media/marketing. I like the idea of a developer. In my mind, maybe we should seek out well-respected people from INETA, or other areas that would be willing to serve on the board and bring ideas. I also think that we might need to have a group of other volunteers, that we elect or they agree, to handle some work for a year. They commit to run things and let someone on the board actually to less work, and more thinking. I think I'm going to upset a few people here, especially as I know some of the nomination committee. And again, I feel like a heel for not participating in this process. I should commit to it next year since I'm going to open my big mouth. The nominating committee is making mistakes. You're DBAs. You're not professional managers and directors for the most part. Some of you run small companies, but you're not hiring people here. You don't have the final decision. But you can stack the deck. And that's what I feel has been done in the past. I'm not sure about 2009, but honestly, I cannot believe that Tim Ford, a passionate person that volunteers, that is committed to PASS, is somehow not qualified for the slate. If he didn't interview well in your mind, so what? He displays the ability to want to work, he's open and engaging with the community, something that a number of board members haven't done. That's what we need in the PASS Board. The committee doesn't choose the board members, so why set much of a bar? Maybe I'm missing something, and you don't want to disparage anyone that applied, or prevent people from considering it in the future, but I think that's a mistake. Some good, honest feedback about all the applicants and why someone was chosen would be refreshing. As Andrew Kelley said, this isn't rocket science. None of the current board is a group I would consider much more qualified than any of the candidates or even people I know that submitted their names. They just aren't. They make decisions that most of this community could make. Get more information out about candidates, more interviews like Brent Ozar did, or let the candidates post the information Brian Kelley mentions, but don't take the nominating committee too seriously. Up to get Kendall to school, and we missed the bus, so we went a little early and sat in the parking lot until we saw some kids walking inside. It was nice to sit there, especially since I hadn't seen her for 2 days. Then back home and to work. But it just feels out of sync. I have some things to do, including shipping off some boxes today and podcasting, but I'm struggling to get going. It's strange after traveling in the middle of the week and missing a day and a half of work. I had never been to Austin, and after a morning run (day 400! ), I walked over to the Monarch Event Center. It's a small facility, with about a 200 seat movie theater, an open space with a stage that could likely seat 300, and a few other rooms. I counted the numbers during the keynote and got to 162, and it seemed that a few more people walked in as the event was going on. The format was a series of 50 minute talks. There were breaks between sessions, as well as a break for lunch. The doors didn't open until just before 9, and everyone milled around in the lobby before then. No coffee, or food, provided then, so I had to duck around the corner for a cup of java. Registration was simple. I'd bought a ticket on the web, and got a copy in email. I printed it out, and it had a bar code on it, which had me expecting some cool application to track who came. Instead when I went to the desk, someone looked at my ticket and marked my name off a list. Not so high-tech! Still it worked, and I got a DevDays bracelet and a blank name tag that I filled out with a sharpie. It was a low budget event, with limited SWAG and sponsors. Fog Creek Software and SmartBear had tables set up with a few people explaining their products. The speaker list was interesting. I hadn't heard of most of the speakers, which isn't surprising since I'm not in the developer community as much as the SQL community. I wasn't sure about some of the topics, but I was surprised in a few cases. Joel Spolsky, of Joel on Software, opened up with a humorous keynote that had people laughing. I've followed Joel's writing for years, and heard him speak a few times. He's funny, and interesting, and worth going to see if you get the chance. The first talk was on Python, by a local Austin developer that does a lot of scientific computing. I wasn't sure if I'd like the talk, but I found it interesting. The focus was on a 21 line snippet of Python code that implements a spell checker and suggests replacements for misspelled words. It's kind of amazing to walk through that code, which was written by Peter Norvig of Google. It's worth reading through his essay, and I was amazed. The talk was an intro to Python tutorial, and I found it very interesting. It finished with a demonstration of a real-time application analyzing the speaker's voice in a few graphs written in Python. Very impressive. Other talks during the day were on various topics. CouchDB, which probably has a place, but I'm not sure is a great replacement for many relational engines. There was one on iPhone development where the speaker built a small clock application. It seemed that it isn't much harder to target the iPhone than other platforms, but it does require working through some hassles with Apple. There was a talk on ASP.NET MVC, which seems like a good idea, but I'm still wary of the data binding. Joel also have a talk on FogBugz and Kiln, a new source control product they are hosting, and a short talk on StackOverflow. A good overview of jQuery was slipped in as well. There was a talk at the end of the day on code reviews, which I almost skipped. I haven't done them in years, and in some discussions with people at lunch, many others didn't do them either. The speaker works for SmartBear, which sells code review tools, but the talk wasn't about their tool. Instead it gave some good reasons why code reviews are good, and I found myself surprised by them. It was an entertaining, and informative talk. Overall it was a good trip, and I had a good idea of how the event might work for SQLServerCentral. I'm not sure if we'll do one, but we have some things to discuss. We, meaning SQLServerCentral and Red Gate, plan to continue to support SQLSaturday, DevTeach, and various other events all around the US and other countries. We've sent speakers and money to both free and paid events, and hope to do more next year. And glad to be here after a 36 hour trip to Austin. I thought Dev Days was interesting, and inspiring. I got some notes, and ideas for 4 or 5 editorials that I sketched out. After the show, at 5:30, a friend I'd met a few years ago swung by and picked me up. We went to his house for a few beers and then out to dinner before he dropped me at the hotel at night. We had a good time, and it was great to sit, talk, and debate a bit with him. Then I was up again, trying to fall asleep, and worrying that I'd miss my 6:15am ride to the airport. I didn't, and had an uneventful trip back to Denver. I had my semi-annual dentist appointment today, 2 of the days I dislike in the year, and went to get it over with. It was an 8am appt, so I had to leave early, saying good-bye to Kendall, who I won't see for a couple of days. I'm heading to Austin tonight and back Thur, but Kendall has girl scouts, so she won't get home before I leave. I got there, was pulled in right away, and got a few x-rays and then it was time to clean teeth. I was slightly worried about the iPhone on my hip with an x-ray machine running near my face, but was covered by the lead blanket, and appears to be working fine. I usually have good cleanings. The dentist I'm with now is a big operation, I'd guess 20+ chairs, and lots of hygienists, but they do a good job. Most of the ladies I've had clean my teeth are older, 45-50+, and are both nice, and efficient. I had one lady for 3 or 4 cleanings, but she retired, and I missed her. However the others that I've had since then have done a great job. I'm not sure why it bothers me to have someone working in my mouth, but I constantly tense up and I'll find my shoulders, head, and even hands tight. It's a constant battle to try and force them to relax while there's picking or whirring inside my mouth. I usually have some plaque, and get some reminders that I'm not flossing enough, but today it was a pretty quick cleaning, without too many comments. Not much bleeding, and the dentist checked me out for 3.2 minutes and let me go. About 35 minutes in and out. The only note was them telling me my tongue has a little scar tissue on it. I have a tooth on the right side that's bent inward and irritates my tongue at times. I've debated braces, but nothing so far. I guess those floss sticks I keep nearby and use once a week are enough. My wife asked me to go to lunch today, a pleasant surprise. She's usually busy, and if she has extra time during the day, she's looking to spend it with horses. Of course I agreed, despite needing to get out of town tomorrow and trying to get lots of work done today. We had a wallet fiasco, both of us leaving ours at home, and had two trips out, but it was good to spend some time together. When we've gone camping with the Boy Scouts a few times, one of the other dads has made what he called a "lumberjack breakfast", cooking some hash browns in a Dutch oven and then pouring in eggs and sausage and letting that cook together. I made it a few times this week for Delaney, and it looked good, so I made a large batch for both of us today. I tweeted about it, but then I searched online, wondering if that was the real recipe. Apparently there are all sorts of lumberjack breakfast recipes, and I think it's more a matter of cooking things family style and sharing. So here's our recipe. Start cooking hash browns in a pan. I use frozen ones, and cook them covered in a little oil or butter in a pan. While those are starting to brown, I cut up a few slices of onion and drop them in the pan. I cut up some sausage and bacon as well. I whip up a couple eggs with water. After 3-4 minutes, I flip over the hash browns and onion mixture, and then add the meat. After a minute or two, I then pour in the eggs and let them cook for a minute. Stir things up until the eggs are cooked. Delaney likes Taco Bell sauce (mild) on his and I think it's pretty good. I also added a warm tortilla with mine. Delaney came up last night and said his glasses were broken. Someone had stepped on the frame, or on the side, and one of the arms was loose and bent. He could wear them, but they weren't very stable. So after karate we headed to Wal-Mart to see about new frames. I was hoping they could repair these, or that the frames wouldn't be too much. They were busy and said we would need to wait 30 minutes, so we decided to run a few errands first. Before we left, we checked the frames on the wall and found his. $118 for the frames, which seemed like a big expense. Made me wish I'd gotten him kid's frames instead, but I sucked it up and prepared to spend the $118 when we came back. When we got back it was dead, so the guy looked up our account and checked. We found frames, and he said that he could pop out the old lenses and slip them in the new frame. He was joking with Delaney and not saying much, but he got the lenses in and then adjusted the arms better. He bent them down, which hadn't been done before, and they were much more secure on Delaney's head. Then he said since we'd bought them last November, we were inside the 1 year warranty. So we didn't pay anything and Delaney ended up with new frames. He's happy, and I was glad we weren't out $100. I don't usually do the Saturday karate class. In fact, I haven't done it in probably a year. It's typically the kids' leadership class and while I don't mind working with some kids, I feel strange. So Delaney and I went down there, and I almost walked in without my stuff. I asked Delaney and he said I should, so I grabbed my stuff, thinking I'd see if any other adults were doing class. As it ended up, there were two ladies, and another guy, so we ended up matched pretty well. We had a decent work out. Not hard, but not easy, and I got a sweat going. I was glad I did it at the end. A friend who also does karate, but didn't today, told me that Delaney did a great job. She was watching, and he was patient and careful with his partner, a kid that isn't always paying attention. That was nice to hear as well. It didn't look cold, especially after it wasn't that bad last night, but when Delaney and I were running errands, my teeth hurt a few times to breath the air, and my Five Fingers aren't holding up well to the cold. My toes were getting a little chilly. The weather check read 23F today and I'm glad it's not windy because it would be unbearable then. Need to find some real shoes and socks for the evening. Kendall got her braces off today, at least for a week. She'll go back next week to get a retainer, but for now she's free of braces. This was after she had to sit through a mold of her teeth. Next week she'll go back for a retainer to get stuck behind her teeth and that will sit there for a year or so. I think Delaney had his for 18 months before it came off. She handled everything well, a far cry from 18 months ago when we started this process. She's looking good and cute, and she is happy to have her braces gone. Delaney got checked as well, and the ortho said that he has a little underbite and so she wants him to grow more before he get braces again. He definitely needs them, but she's thinking not until he's 15 or so when he's mostly done growing. We haven't had great ortho luck. Kyle had the teeth and braces from hell for a few years as they tried to get a tooth to come down. Delaney hasn't been bad, but it's been slow and Kendall had lots of trouble with wires coming loose and poking her. I will be glad to not have any braces on kids for a few years. I took a few days off recently to get a break from work. I've rarely taken time off since last winter, often working weekends, and I could feel the stress building. So I arranged for a few guest editorials and scheduled last Thursday and Friday off. My wife was sure I'd be firing up the computer and working a bit, but I really tried to avoid that. So I tiled my bathroom. This was my bathroom last week before I started. An ugly, gray carpet that the builder had put into the house. It was in the whole house, including the 4 bathrooms, when we moved in. I had tiled the other 3 baths the first year we lived there, but had avoided our master bath since the room is used so much. And it's a big project, about 95sq ft of floor space. But I thought I could get it done in 4 days, Thur-Sun, if I had nothing else to do. My wife was planning on being gone to some horse event, and the kids were in school a couple days, and could hang out with friends over the weekend. As I started to write down my plan and get a list ready to go shopping, my wife asked if I really wanted to spend my vacation working around the house. Wasn't there something else I'd rather do? Go out, do something, see a ball game, etc. There are some things I'd do, but what I was saving vacation for was to do a lot of snowboarding this winter. Since it's too early to do that, and I needed a break, I thought this would be simple, mindless work that would give me a sense of satisfaction. I ended up losing all of Thursday to other chores and shopping for supplies. That meant that Friday was devoted to ripping out carpet and getting the underlayment down. Then Saturday was cutting and gluing tiles. I didn't finish, and that actually moved into Monday to get the last few tiles done, but I had started grouting and here was the current state on Sunday night when I knocked off. My wife asked me if I felt better, and was it a good vacation? I said it was. Despite a sore lower back and knee, despite some nicks and cuts, and a lot of up and down the stairs, I felt like I accomplished something. I still get satisfaction from going in the other bathrooms, and seeing the work I've done, and I still like driving by the 1000' fence I built in our last house. Those projects stand out to me and give me a sense of accomplishment that pushing bits around doesn't. It was supposed to snow today and I woke up to a misty, wet, cold morning. I got Delaney to school and then took out some trash when Tia got back from dropping off Kendall. At that point I wasn’t sure what I wanted to do. I had planned to hit karate this morning since Delaney was thinking to stay late and work the concession stand after school and I didn’t want to drag him from there to karate. However I needed to run as well. Didn’t want to break the streak at 393. After I got some work done, I decided to just head down and get the run done before karate. I took a sweatshirt, hat, and the Nano. Flurries were coming down here at home, but it seemed to clear up and just be cold as I got to Parker. Running a bit late, I swung into the parking lot a little fast, making one of the other ladies in the class look up. I slowed down to park, and then raced out of the car, iPod on, pulling on my hat and heading down the block. There’s a good route that I take around a few blocks near karate that’s just over a mile. As I started down the road, trying to hurry since I only had 15 minutes, it started to snow. Not a big deal, but it was cold as well and I had to pull my hands into the sleeves. But it felt good, I raced around quicker than normal, and then went into karate sweating pretty good. I tried to take it easy, especially working with a new lady, but it’s hard to completely stop the effort. I worked slower during warmups, and tried not to hit hard on drills, but still had a good sweat. I threw on a sweatshirt for the ride home and was wet. I got cold, and had to pull it off and start some laundry when I got home. After moving my rain shower head upstairs, I had a nice hot shower and feel much better now. Not quite looking forward to going back out to get kids. We've been doing video conference calls for work through LiveMeeting for a few months. After two years of audio only calls, I have to say that the video was helpful. It adds to the meeting and it keeps me more focused. It's not great, and it's not like being there, but it was better. However we had some technical issues. Video and audio dropping out, and we were ready to go with the audio call and video through Livemeeting. I think it's the bandwidth to the company office in Cambridge, which seems spotty for video. I've been also doing weekly calls with the editor of Simple Talk across Skype, and that seemed to work well for us. There have been times when one of us has dropped off, but the quality of the video and audio seemed much better than Livemeeting. So last week we actually tried Skype. It worked OK, except for the need to keep flipping a laptop around to see who was talking in the UK. The problem with Skype is that it only does 2 way video calls. Brad, the other member of our team, lives in Hawaii, but was out of town last week. Adding him in wasn't possible through Skype, so it appeared we might be heading back to Livemeeting. That wasn't very exciting since we'll get dropouts of 1-3 minutes at times and it's not apparent that things are down. During my call to the office last week, my video kept freezing in Skype, despite my Multi-cam driver showing me it was still working locally. Then I remembered a friend telling me about Oovoo. It's another service like Skype, but they have some business features not the least of which is up to a 6 way video call. It's not cheap al la carte, but they have some good plans, and it seems if they get some people using the service, it's a sustainable model and company. I downloaded the client, and we set up a 3 way call today. They show each person in a little window, and it seems much more stable and easy to use than Skype. The client was a little unintuitive for me at first, but I got it working, and we had a 3 way video call that was the best quality we've had yet. The one downside to video conferencing is the audio. During our Oovoo call we had echoing from one person's computer,and I assume it came from mine as well when the speakers outputted something and the mic picked it up. I put on headphones, which I think helped on my end, but we need to get some for the other people. The conference room as well needs better mics. I think they probably need 4 or 5 directional mics that face each person since once they're around a square table that's 6 or 8 ft across, sounds echo in the room. The staccato British accent doesn't help as well. Video conferencing has come a long way since I first tried to get it working for my boss in '94, and it's at the point where I think it works fairly well for short meetings. After tiling all day Friday I needed a shower, but our bathroom was a mess, so I went to the guest bathroom downstairs and took a shower there. That head is old, clogged, and throws out tiny mist jets of water that hurt. I don't mind a little pressure on the shower and even I didn't want to put my face in the water. So Saturday when I needed to do the same thing, I instead stopped for a minute, unscrewed it, and instead put on a rain shower head I'd gotten at Home Depot. It was plastic and cheap, and the arm could barely hold the head up where I wanted, but I loved it. 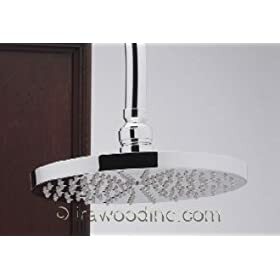 I have seen "rain" shower heads for years and never thought much of then, but this was great. Last night I had both little kids take a shower down there to try it out and see what they thought. They both loved it. They said we should get one up here. So tonight I was looking online for some, trying to match the bright brass finish in our bathroom. I am amazed at the selection and prices. There's simple arms like this BathLogix hi/lo, though not Brass. It's $60 from Bed Bath and Beyond. 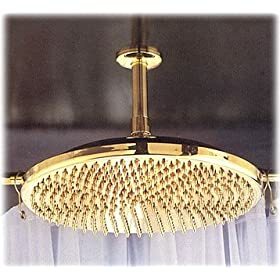 Or there's the Rohl 1075/8 Single Function Circular Rainfall Shower Head for $538. I'd like to get a nice one, maybe splurge a little, but I think $100 or so is a splurge for a shower head. We'll see. I'm likely to just see what is available at Home Depot or somewhere locally and just get it. Sore legs, sore neck, I almost skipped karate, but hey, what's life if you don't push? I did take it easy, slowing down my warmups and combinations, working technique more than speed, and trying to avoid making things worse. It worked, and while my neck is still sore, it's no worse than before and the body feels like it accomplished something today. Feeling stress at work and needing a break, I decided to take a couple days off last week from work and tile our master bath. I had done the other 3 bathrooms a few years ago, but I had left this one alone. Mainly because I couldn't shut our bathroom down for a couple weeks while I worked through there. Here's the before picture of the bathroom. It had ugly, gray carpet, cheaply made, stained, and old. Probably 10+ years old from when the house was built. This was throughout the house, including in all 4 bathrooms. In the first year I was here, I replaced the carpet in the other three bathrooms with tile. Each of those projects was smaller, from the hall bath at about 30qs ft to the downstairs guest bath with a corner shower and half wall in the middle at about 60sq ft. However our bath was the largest, and toughest, at about 95 sq ft.
We had replaced the carpet in the rest of the house with a combination of new carpet and hardwood, so this carpet was the last bit in the house that needed to be replaced. Sounds easy, and it's not that bad, but it is time consuming and it's work. After I finished the 3rd bathroom about 2 years ago I was motivated. I removed the trim from our bathroom and started cutting backerboard. I'm not sure what intervened, but the backerboard has been in my closet along with the trim. So that step was done for me. I had started by cutting about backerboard to fit about half this room. I started from the far left corner above, intending to start there with the tile as well. I've heard this is the best way to be visually pleasing to the eye, and I wanted to get as many full tiles as I could. The image above is the vent in the far North side of the bathroom. Here I measure the vent dimentions and transferred them to the backerboard as shown here. Once I had these done, I had a good template for cutting out the board. This board goes down on the subfloor, which has always been plywood in the rooms I've worked on. I spent a lot of time on my knees, and buying a set of knee pads if highly, highly recommended. These make a big difference and prevented soreness on my knees. They don't help with the strain of getting up and down constantly, but that's a part of getting older I've learned to deal with. Below you can see me measuring out the backerboard. I had all the large pieces measured and broken before I pulled up the carpet. Pulling up the carpet isn't that bad. Carpet is typically just tacked down onto small nails and held in place with tension. With the trim removed, I could usually grip the carpet near an edge and pull it up. The carpet is usually in pieces, and in this case where were two pieces in this main room, and one just to the right of where I'm standing above. They tend to pull up together, and you have to watch for carpet tape and remove it if you don't want all the carpet coming up. In my case, I didn't want to lose the toilet the first day, so I separated that piece from the others and pulled up this room as one large part. Once the carpet is up, this tack board is all around the border of the carpet. It's not hard to get up, but it's sharp with little brads sticking up, and you have to work your way around. This was the near the end for me as I went in a circle. Between the carpet and pad, I filled two bins with trash. It was a dirty, messy, smelly job, but I was glad it was done. With little kids growing up here, we had numerous overflows of the toilet, and that carpet wasn't horrible, but not a lot of fun to pull up. Once that was done I glued down all the backboard with the same tile mortar that I'll be using for tiles. I also had some backerboard screws I put in as well. I think you could get by without the mortar, but I've used both and it's worked well for me. When I decided to tackle the bathrooms, I knew that a manual cutter wasn't something I wanted to mess with. I had heard wet saws work much better and with 4 bathrooms, plus a 5th in the basement if we ever finish it, this seemed like a good investment. I'm not sure what I paid, but I got a 7" one and they were $149 at Lowes as of this post. You fill it with water, and then turn it on and slide the tile across, as shown. It's not hard, and if you go slow, it cuts fine. However it throws a nice stream of water back, and the front of my shirt and pants usually end up wet. You also need to regularly add more water to the tank. Fri and Sat this was no big deal. It was nice, and I'd measure a few tiles and then cut them, setting them in the grass to dry while I went to measure the next batch. I'd cut a new batch of 2-4 tiles, set them out, and take my dry ones up to fit in place. This worked out pretty well. These are mostly full tiles, with straight cuts, but as you can see, you can actually get some intricate cuts at times. Like this one that went from the bathroom, with an angled wall, to the closet. I slowly made my way threw the bathroom, as you can see. I used 1/4" spacers to mark my place, and when I had the entire main room done, I glued them all down in one session. That was Sat night that I glued them down, and let them sit overnight. You're supposed to avoid all traffic, but our closet is through the bathroom, and Tia was coming home late. I left the spacers in place, and it didn't seem like things moved. I hadn't done the closet or toilet room, or even removed the carpet from the toilet area. But it was a long day. I was beat, and I showered downstairs and lay down to wait for Tia to get home and watch the Miami/Oklahoma game. While we were at Wal-Mart last night getting a few groceries that were needed, my throat felt a little itchy. And swollen, pressing on my windpipe. Nothing major, but it felt like the start of a cold. It got a little worse last night, and so I crashed after getting kids to bed. Tia had just gotten home from riding horses and said she'd get up with kids. So I tried to sleep, but kept waking up, tossing and turning. I was constantly thirsty as well. At one point I moved and my neck woke me up in pain. I pinched a nerve, and it was hard to sleep after that. I kept drifting in and out of sleep, hearing Tia get kids moving, and finally got up at 8:30. I felt better, and the neck was less sore than at night. A rough start to the day, but I'm feeling better. Going to try a run soon and see how that goes. Loveland opened today! At least on their site they list today as opening day. However as you can see from the main basin camera, there's not a lot of snow up there yet. 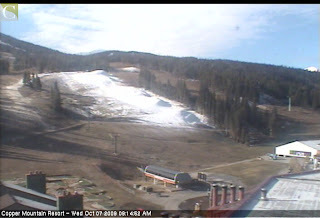 They are making snow, and the images from the top of chair one look pretty good on that page. I checked Copper, and they have some snow, but nowhere near enough to open. We're going there for Thanksgiving, so I'm slightly concerned. 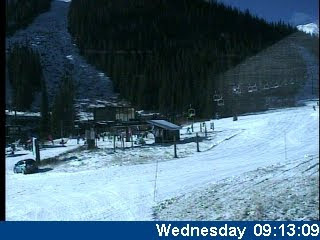 Arapahoe Basin, which is supposed to open on Friday, looks pretty good. I took the kids last night to get new boots. We're almost set, picking up Kendall's skis this weekend. She was a little annoyed that we didn't get her new ones, but these should still be OK. Delaney's board is also fine, but we had to go to the smallest adult boots for him. I'm out of town next week, but it is looking good for a day or two of skiing in October. Actually I don't hate maid day. It's nice to get the house clean and have things less dusty. What I hate is the night before, or morning of, when I have to get things put away, off counters, and chase kids around to do the same. Usually Tia drives it, but I feel somewhat responsible to help out and make things happen. I started kids on their rooms after school, or in Delaney's case after YouTube. I'm dreading going to check on them as I'll likely have to re-point them at more things that need doing. I applied the last 10sq ft or so of grout to the bathroom after karate last night. I was tired, but I wanted to get it done. I mixed up a batch, and had just enough to get things done. Surprised myself by how close I was. I then wiped down some of the other tiles last night, and again a couple times this morning. I was waiting until it’s all wiped up to apply the sealer, but I’m thinking I’ll get it done tonight and then get the toilet back and we’ll have a bathroom back. I watched half the game last night, Packers v Vikings, mostly because of the Favre v Packers matchup. Plus I love football, and so I kicked it on while wiping down some tile and finishing applying grout. Tia was blogging, and when she finished, I think I had tested her patience enough and switched to a sitcom. As I watched, and as I listen to ESPN this morning, I’m a little amazed. I hear so many people talking about how championships matter for the Hall of Fame, the scoreboard is the final judge, and even how the MVP comes down to having a playoff bound team. After all, your individual stats don’t matter as much if the team isn’t successful. So why do so many people say Rodgers is better than Favre? I’m sorry, I just don’t see it. I hear the same argument for Carson Palmer in Cincinnati. If you can’t lift the team, and generate wins, then I’m not sure you’re a great quarterback (or hitter, shooter, whatever matters in your sport). As much as I think you can talk talent, I hear Jeff George quoted as being immensely talented, but not being able to win. So why doesn’t this apply to Rodgers or Palmer? It seems that so many people are willing to give them passes based on their team. I have never been a Favre fan. I was happy to see the Broncos beat him, see the Cowboys stop him in the playoffs for years. I think he’s too much of a gambler for me, and that he’s lucky with some of those throws. But he wins. He gives you a chance to win, and while I thought his throw against San Francisco at the end was a little lucky, he made it, and it was quite a throw. I think he hits that 3 times out of ten, not 8, but still. Watching him last night, with that little-kid-turn-your-body-and-wing-it delivery, it’s amazing. He can still hum the ball across the field in ways that I think few guys can. There are some strong arms, Cutler among them, but not that many that can wing a ball on a line 40 yards like it appears Favre still can. I’m still not a fan, but I’ve come to respect his talent, and his ability to win. Until Rodgers and Cutler can win more games, they’re not the best QBs in that division. Delaney got up and came downstairs. He said that his head hurt and eyes hurt. I got him to eat some food, thinking he was tired. It’s been hard to get him to bed at night and he’s struggling to get going some days. However today he was sick. We loaded up and got in the car and as we started to drive, he opened the window and said he had to throw up. He didn’t, but we drove back to the house and he did throw up after that. So he’s back to bed, trying to rest and sleep. Hopefully it’s because of a lack of sleep and not an illness, but we’ll see. This is part II of my journey to being a DBA. I was "tagged" by Jacob Sebastian, so I decided to make my entry. Yesterday's entry, Part I, looked at my education, and today I'll talk about my career. I wanted some practical experience, and I thought that an internship would be good. Even if I took another year to graduate, it would help ensure I got a good job, so I started looking around. This was 1991, and the Internet hadn't exploded. Windows was unknown, and computers were being used in business, but they weren't as commonplace as you might expect. The local power company, Virginia Power, had offered internships to students at ODU and since I was still an EE major at the time, I applied. I'd learned some tricks for interviewing my senior year of college, and one of those was to research the company and prepare a custom cover letter for your resume. Another was to be prepared for the interview by showing some knowledge about the company. So I did that, heading to the school library to look through magazines and the microfiche for information on Virginia Power, which was owned by Dominion Resources. I picked up a few facts, applied, had a great interview and got a job. I was assigned as an EE assistant to the Surry Nuclear Power Station. When I heard the offer, I was both surprised and a little nervous. I knew little about nuclear power, and wasn't sure how closely I wanted to learn more. But it was a good internship, it paid something like $12/hour in 1991, which was good money, and it was a new experience. Plus I had to get a security clearance. I later learned that was a stumbling block for many people. Luckily I had no major issues in my past. Working at Surry was interesting. My first few weeks involved no computer time. I worked with electrical engineers, mainly dealing with paperwork and ensuring things were properly signed off and filed. The amount of regulation in this industry amazed me. After a few weeks my boss asked me if I had computer skills and could I help him with a Lotus 1-2-3 project. He was trying to manage a schedule of projects and calculate times for various items. I said I could figure it out and entered the wonderful world of Lotus 1-2-3 macros. I built one of those spreadsheets that recalculates all kinds of things when it's opened; the kind that makes DBAs cringe. It was a classic example of knowledge being stored in a spreadsheet that would be better stored in a database, but we didn't know how to do that and no resources were available from IT to help. It worked well in a limited capacity, but not great. Around this time I met the IT guy for the power station. He was rough, gruff, ex-Navy EOD (explosive ordinance and demolitions) expert that ran a tight IT ship. He had 3 people + an intern supporting 1400 people at the station, and roughly 800 PCs. He noticed my work and said that he had a project that was similar and could probably help us better than my spreadsheets. He asked me if I knew about databases, and gave me a book on dBase III. I dug through it in a week and received a book on Clipper for my troubles. His project was based on Clipper for DOS, and I spent a week learning the architecture and basics of how a Clipper program and database was structured. Most of the programming made sense to me and I was off and running, finishing off his work. 4 classes in computer engineering, including Fourier Transforms. Needless to say I was exhausted most of the time, and eventually realized that I couldn't maintain this schedule. I tailed off after Thanksgiving, quitting the restaurant job and surviving on my savings and a small paycheck. However I also gained some programming experience and built a system that many secretaries appreciated. I was offered the chance to start my spring internship early over the Christmas vacation. I agreed, and one of my first assignments was to get ready for a new radiation monitoring system that would be put in place on Jan 1. I was assigned to baby-sit the programmer installing the system on Dec 31, being the most junior member of the team. I arrived at work Dec 31 about 4:00pm, expecting to be there late while things were switched over. Around 8pm all work in the reactor area was stopped, people checked out, and the old system was shut down. The programmer started setting up the new system and transferring data from the old system over, converting it to this "new" database. That database was SQL Server 4.2, running on OS/2 1.3. At midnight we turned on the system, and a few workers started to use it. It promptly crashed. We rebooted the server, it ran about 30 minutes, and crashed again. We couldn't roll back to the old system since it was now illegal to use, and we didn't have a working system. That next week was interesting, with 4 of us on the IT staff baby-sitting this server, which needed constant reboots. One of our staff was pregnant and assigned to handle daily duties, while the rest of us basically worked 8 hours on, 8 hours off. With a 45 minute commute to work, I didn't do much more than drive home, shower, sleep, and come back. I logged 100+ hours a week for the month of Jan, moving into Feb. In that time I also learned a lot about OS/2 and SQL Server. We upgraded through 4.2, 4.2a, and 4.2b for SQL Server and moved to OS/2 1.3 and then OS/2 2.1. Those upgrades provided a little stability and we managed to lower our hours to a more reasonable 60-70 hours a week. During that time I read all the SQL Server manuals, learned how to analyze the server, even how to contact other SQL Servers linked to ours through the probe account. I taught myself quite a bit about SQL Server. It was during this time that I met my first real DBA. The company hired a full-time DBA to work on SQL Server and get the server stable. He spent a lot of time at our station and I asked him question after question. He upgraded us to Windows 3.1 Advanced Server and taught me about keys, referential integrity, indexing for performance, and more. He also let me know that he was being paid $90k a year in 1992 for his work. I'd enjoyed DBA work much more than system administration over the first few months of 1992 and taught myself a lot of SQL Server. During this time I was offered a position as an application developer using FoxPro. I took it, and continued to develop against SQL Server, the mainframe the company had, and Oracle databases. I began to expand my knowledge of relational databases, and learned a lot. I transitioned to Visual FoxPro and it was time to move on. I applied for a few DBA jobs, and ended up getting one that was an IT manager for a small company that used SQL Server 4.2, and was transitioning their homegrown application to SQL Server from FoxPro. It was a good fit, and I learned a lot about business and managing projects in that job. I stayed there for 4 years until I again felt the urge to move on, driven by the Internet boom. We decided to move one fall after 14 straight days of rain in my native Virginia. My wife had been working from home for a few years, and so it was up to me to find a new job. We'd both traveled for work to various clients and conferences and a few cities in the Western US called to us. Denver was our top choice, and I began searching for a job. I found a similar job to the one I'd been doing, senior DBA at a small firm that also needed some systems help. I flew out, was offered the job, and planned on moving a month later. I came out alone in Feb of 1999 and found myself in charge of another DBA as well as in charge of systems. I learned that SQL Server 6.5 under load wasn't very stable and found myself digging into many new issues on this platform. After 2 years of fighting daily fires, upgrading to SQL 7 and Windows 2000 for selected systems, and having spent many nights sleeping on the floor of my office, I moved on. This time I was strictly looking to be a DBA and found myself at another startup, employee 21 at IQDestination, a learning company. That fit well with my skills and interests, having been writing for a few years and publishing short articles. I'd started writing for Swynk the year before, and enjoyed the publishing business. While I was at this job, Swynk was sold and SQLServerCentral was born. Working at a startup, wearing a few hats, and trying to develop software on a regular basis was interesting and enabled me to find lots to write about. Answering questions on the SSC forums built my skills further, and helped me at work. It was a great position, and there was a time when I was thinking of asking my boss to work part-time, 3 days a week, and working on SSC 2 days a week. It seemed possible. We knew sales were down, but it was one Thursday that I was called into a meeting with a few other senior IT employees and management. We were literally down to a few weeks of money and our owners were begging for more capital. We were told to be on call for the weekend. Sunday we were called to say that we needed to disable all accounts and come in to work to start shutting down equipment. We literally moved dozens of machines out the door on Sunday to various people's houses as our owner didn't think that the landlord would let him back in when they were told the company was shutting down. This was 2001 and it was a low point for me. I was a top-notch DBA, I knew a ton about SQL Server, but I couldn't find a job. I had a one-year old daughter, and spent 9 weeks at home, looking for jobs, getting few interviews, and caring for kids. It seemed that all my career efforts had been in vain. Finally I was offered a job at JD Edwards, for more money than I would have taken. That was interesting because they later told me they didn't think it was enough. After working at JDE for a bit over a year, they were purchased by Peoplesoft. It seemed that the economy and sales were striking again. I had my resume together and started sending it out, in anticipation of being let go. I wasn't, and in fact received a promotion to manage 10 DBAs for all of the Peoplesoft production systems. I also got a great raise, from $86k a year to $88k a year. Needless to say I was less than excited. More work, back to regular fire fighting, and lots, and lots of phone calls. Between most of my team being in CA and issues with systems, I was literally on the phone 6-8 hours a day. It was a challenge only in that I had to manage keeping batteries charged in my headset and cell phone. I was sending out resumes regularly when things at SQLServerCentral changed. Andy, Brian, and I were all sharing the duties of running the site. We'd continued to evolve the site over the past 2 years and were making money on the site. However it was also a burden to us, all working full-time jobs. We were considering selling the site when we closed a big advertising deal with Quest in early 2003. They paid us for a year of advertising all at once, which gave us a nice cushion of money. After a few debates over the phone, we decided that one of us would need to manage the site full time if we didn't sell. Since my wife was working and provided me with benefits (medical, etc. ), I was the best choice. So in April or May of 2003 I left my job and started running SSC full-time. At first I took some consulting jobs as well, thinking that I'd need to fill my time and continue to work on SQL Server. That ended quickly as we started up Database Weekly (then Database Daily) and the site continued to grow. By keeping active in the forums, I continued to learn and grow my SQL skills. It was at this time the editorials started. We use to run an advertisement in that spot, or announce something like the PASS conference. However as I tried to vary the content, I became bored with simple advertising-type content and started writing about SQL Server and things I thought were interesting. I had no idea that the editorials were interesting until Nov of that year when I got to the PASS Summit. Quite a few people complemented me on the editorials, and I knew that was something I'd be doing for a long time. I continued running SSC until the summer of 2006 when Red Gate software approached us about purchasing the site. They did, and I went to work for them that November. I've been doing that ever since. In the years since I left full-time technical work, I've kept myself involved with SQL Server in a number of ways. Constantly answering questions on the forums, often having to research an answer, had helped keep me aware of the product. I read a lot of articles on SQL Server, and I've written a few books and tech edited others. Those activities have continued my journey as a SQL Server professional. That's my journey, and hopefully a few of you found it interesting. I am not tagging anyone since, well, it's not really something I like to do.